Mashup tools are a class of integrated development environments that enable rapid, on-the-fly development of mashups - a type of lightweight Web applications mixing content and services provided through the Web. In the past few years there have been growing number of projects, both from academia and industry, aimed at the development of innovative mashup tools. From the software architecture perspective, the massive effort behind the development of these tools creates a large pool of reusable architectural decisions from which the design of future mashup tools can derive considerable benefits. 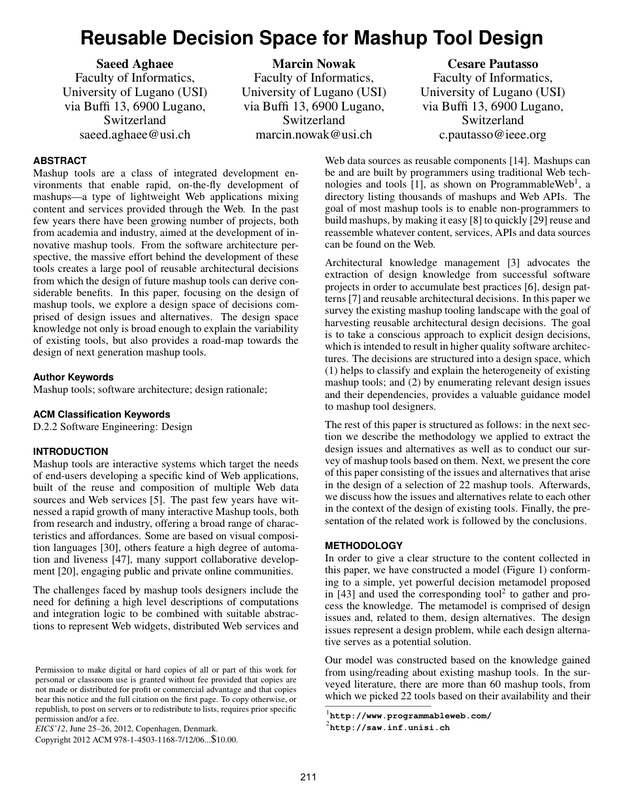 In this paper, focusing on the design of mashup tools, we explore a design space of decisions comprised of design issues and alternatives. The design space knowledge not only is broad enough to explain the variability of existing tools, but also provides a road-map towards the design of next generation mashup tools.